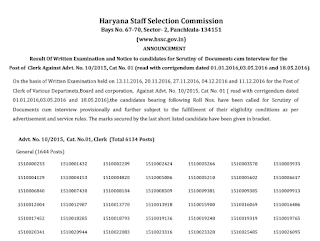 HSSC Clerk Written Result,Merit List/Cut Off Marks 2017 Declared. On the basis of Written Examination held on 13.11.2016, 20.11.2016, 27.11.2016, 04.12.2016 and 11.12.2016 for the Post of Clerk of Various Departmets,Board and corporation, Against Advt. No. 10/2015, Cat No. 01 .